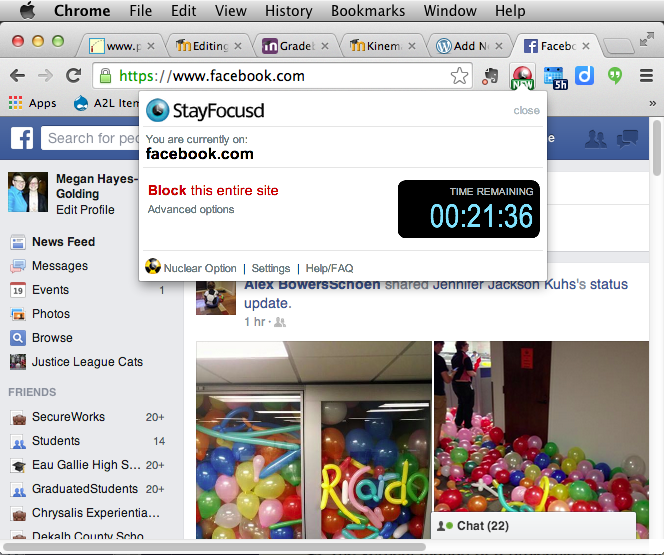 StayFocusd is my extension of choice for blocking distracting websites. Get StayFocusd or similar browser extensions to stay off distracting websites whether you use Chrome, Firefox, or Safari. by managing work and rest time in a sustainable way. I don’t want to marathon for two hours then be done for the day, for instance. I like the Pomodoro Technique (25 minutes of work followed by 5 minutes break) for its simplicity. Get a timer for your computer or desk. What do you use to get focused and stay working? I didn’t know such a thing existed! I typically use good old fashioned will power to get focused. I also write down my daily goals as a very detailed, prioritized to-do list. Once I knock a few items off, it gives me the motivation to continue until I’m done or very close to it. I also can get really overwhelmed when I have a lot of work to do, so crossing things off the list makes me feel accomplished and even everything feels more manageable. I’m a sucker for productivity posts, Megan! The only, only thing that works for me is the simplest solution to internet distractions: going far away from the internet. My paranoia of being near a computer has had the healthy side effect of making me rethink which of my projects really need a computer in the first place. Thanks, Michael. Please tell me you read Lifehacker if you like productivity posts. 90% of what I do or use for productivity comes from them. I agree about getting away from the internet — sadly I’ve set up so much of my educational practice around online stuff, that I cannot get offline at exactly the time I need to focus. The “Go Nuclear” option on StayFocusd is great for those times. I can block out everything but the exact sites I need to write a test or grade essays, for example.